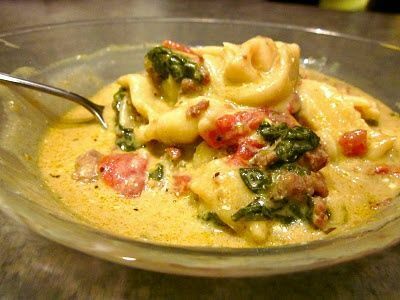 THE BEST Crockpot meal I’ve tried yet: Ingredients: 1 bag of frozen tortellini 1 small bag of fresh spinach 2 cans of italian style diced tomatoes 1 box or 4 cups or vegetable broth 1 block of cream cheese put all ingredients in crockpot, chunking up the cream cheese. Cook on low for 5-6 hrs. THE BEST Crockpot meal I've tried yet: Ingredients: 1 bag of frozen tortellini 1 small bag of fresh spinach 2 cans of italian style diced tomatoes 1 box or 4 cups or vegetable broth 1 block of cream cheese put all ingredients in crockpot, chunking up the cream cheese. Cook on low for 5-6 hrs.